Among all the other things that were going on in narrative painting in the 1800s – as seen in the works of Delacroix, Moreau, Gérôme and others – there were the remarkable paintings of Honoré Daumier (1808-1879). Daumier was an established caricaturist, print-maker, and even sculptor, whose oil paintings were something else, something strongly pre-Impressionist in their painterliness, gestures and marks. Yet for all that looseness, many of his oil paintings were strongly narrative. At the time, he was best known for his biting political and anti-establishment caricatures, which were most savage in their portrayal of lawyers and judges. His lithographs show his drawing skills, and his frequent reliance on facial expression. 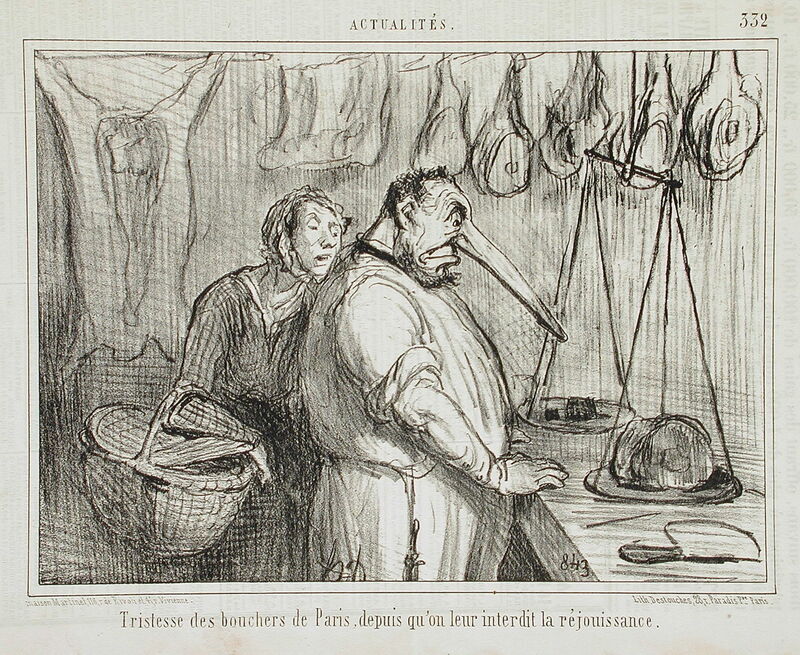 Honoré Daumier (1808–1879), The Sadness of Paris Butchers (1855), lithograph published in Le Charivari, 17 October 1855, 17.6 x 24.1 cm, Los Angeles County Museum of Art, Los Angeles, CA. Wikimedia Commons. The French Republic was proclaimed on 24 February 1848. Within a month, a competition was launched to produce the “painted face of the Republic”. Daumier entered this oil sketch, which came eleventh out of more than 700 entries, but was never worked up into a more finished painting. Honoré Daumier (1808–1879), The Republic (1848), oil on canvas, 73 x 60 cm, Musée d’Orsay, Paris. Wikimedia Commons. 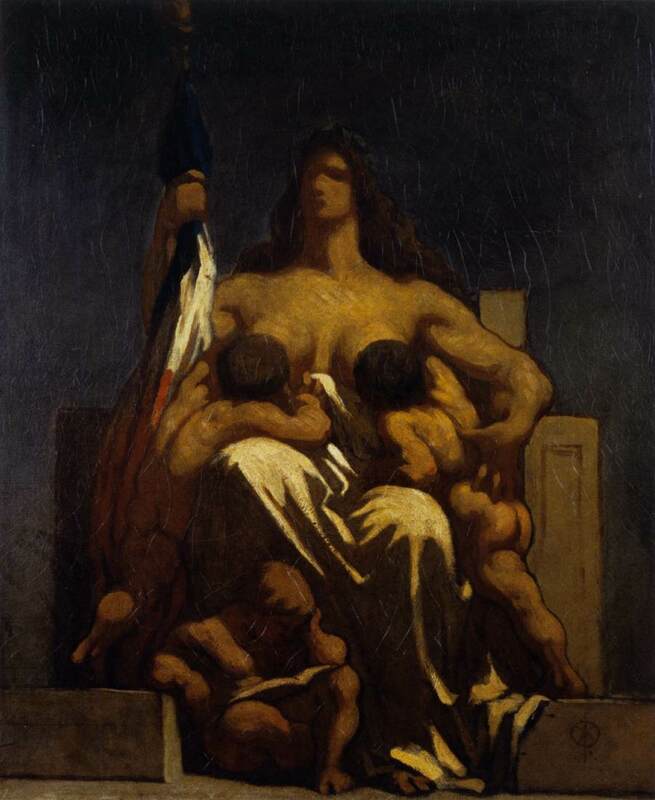 Based on an earlier sketch of his from about 1844 entitled Charity or Caritas, the goddess of clemency, it shows a mother nursing children and holding the French tricolour flag. In this, she sums up the ideal of a strong republic, in her fertility, serenity, and glory, as a development of the female figure dominating Delacroix’s most famous Liberty Leading the People (1830). It was in the 1860s that Daumier painted many of his narrative oil paintings. Among the best-known is The Drama (1860), which was chosen by Martin Meisel (1983) as a “brilliant” example of narrative painting. 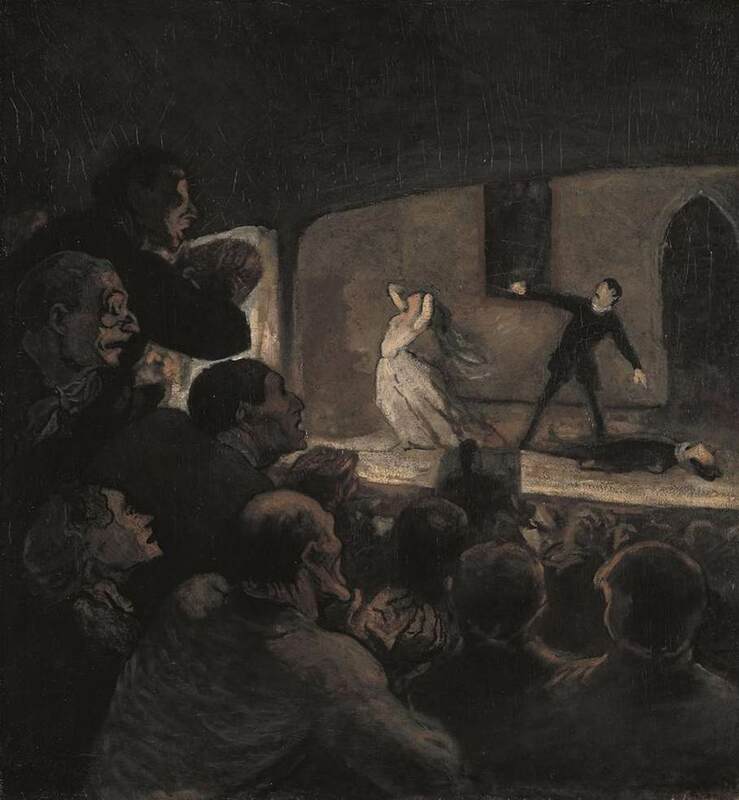 Honoré Daumier (1808–1879), The Drama (1860), oil on canvas, 98 x 90 cm, Neue Pinakothek, Munich. Wikimedia Commons. Unusually, the narrative is shown in a stage scene viewed from within (and including) the audience. On stage, a man lies dead, while a woman faces away, showing theatrical body language indicating her distress. Between them a second man points with his left arm down at the corpse, and with his right arm at the woman. But their facial expressions are not seen. In contrast, members of the audience show exaggerated facial expressions of shock at the scene in front of them. I do not know whether Daumier intended to separate the classical elements of narrative painting laid down by Alberti, but as a play within a painting, this deceptively simple image presents a debate between those elements which appears timely in view of the changes which were taking place in narrative painting at that time. It is also worth noting that the play, a tragedy, has reached a moment of peripeteia. 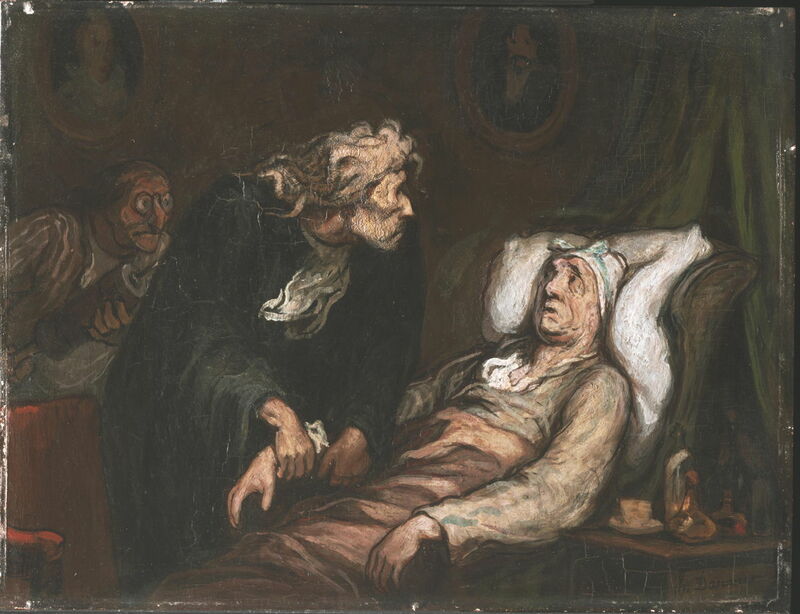 Daumier’s Le Malade Imaginaire (The Imaginary Invalid) (c 1860-2) is also based on theatre, but in a very different way. Referring to a still-popular Molière play of the same name (1673), it shows Argan, the hypochondriac hero of the play, suffering his imaginary illness in his armchair, his physician feeling his pulse at the right wrist, and the physician’s assistant poised behind, wielding a large enema syringe. The facial expression of each of the figures is carefully crafted, with rich brushstrokes left visible. Argan appears ill, drawn, and worried; the physician wears an expressionless mask beneath tousled almost Medusan hair, and his assistant is gaunt and grimly eager to engage. By Argan’s left elbow, on a small table next to the armchair, a clutch of medicine bottles stands ready. Honoré Daumier (1808–1879), The Parade, or Street Circus (c 1860), watercolour on paper, 26.6 × 36.7 cm, Musée du Louvre, Paris. Wikimedia Commons. Although Daumier’s oil paintings became increasingly gestural and sometimes hard to read as a result, his watercolours were more plainly drawn, if their narratives often seem more tricky. This shows a group of mountebanks, theatrical performers, musicians, and clowns who drew large crowds – a theme which he often returned to. Their facial expressions and gestures are theatrically exaggerated, but the narrative less apparent. The crocodile suggests it may be one of the Pulcinello or Punch and Judy shows which were popular among street performers in several European countries, including France, and North America from the 1700s onwards. No less than thirty of Daumier’s oil paintings show scenes from Cervantes’ epic Don Quixote (1605, 1615), tracing the adventures of a man who, under the influence of chivalric romances, sets out on his own hilariously misguided knightly quest. Here Alonso Quixada, alias Don Quixote de la Mancha, and Sancho Panza, his squire, come across a dead mule (Book I chapter 23) while crossing the Sierra Morena. In the book, the dead mule is described as being still in its full harness and saddle, which Daumier here omits. Quixote, much of Panza’s mount, and the dead mule are shown in sketched outlines, just sufficient by way of marks to enable their identification. There are no faces, and body language is minimal. As Daumier’s eyesight faded into complete blindness by 1873, his narratives were also supported by the most minimal painted marks. 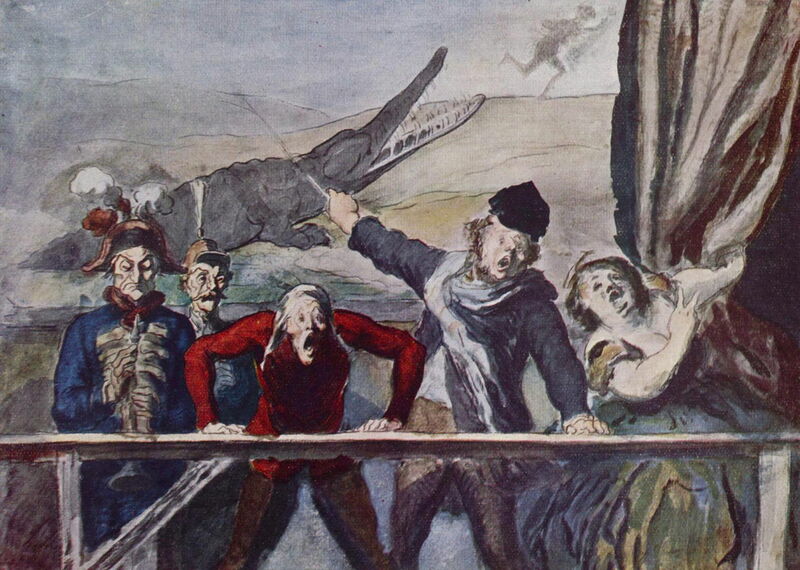 Daumier took narrative painting in yet another direction. Using his great skills in caricature, he examined the classical approach of Alberti, used sophisticated theatrical settings, and his technique became almost purely gestural. Although none of these was able to resolve the problems faced by narrative painting at the time, they offer points of departure which can still be valuable. The Daumier Register, online catalogue raisonné, and copious information. Meisel M (1983) Realizations. Narrative, Pictorial, and Theatrical Arts in Nineteenth-Century England, Princeton UP. ISBN 978 0 6916 1293 5. Posted in General, Painting and tagged Daumier, gesture, narrative, painting. Bookmark the permalink.